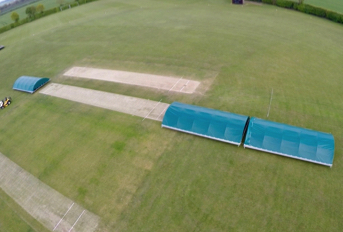 With Great Brickhill’s village cricket club, tennis club and Parish Hall all sharing a sports ground when it came to significantly upgrading the facilities it made sense for the two sports clubs and the council to join forces in their approach to raising funds and sourcing contractors. 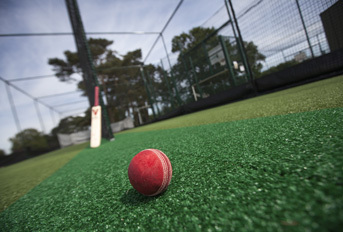 With a ‘wish list’ that included new non-turf cricket practice net facilities and a new Multi Use Games Area alongside the upgrading of fencing and installation of floodlights to the existing tennis courts, a task force was put together to identify and target funding streams that could help the partnership generate the capital to bring vision to reality. 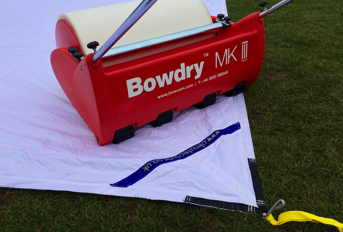 Thanks to a concerted team effort over 60% of the overall project budget was secured from funding streams. 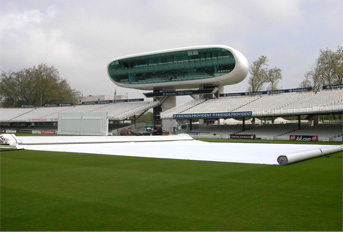 With the ECB supporting the cricket side of the project through the England & Wales Cricket Trust, contributors to the wider scheme included WREN (via the FCC Environment to the Landfill Communities Fund), the Aylesbury Vale Community Chest and Great Brickhill Parish Council; with the clubs’ combined fundraising efforts also contributing significantly to the overall cost. With funding in place, the partnership began investigating contractors for the various elements of the project. 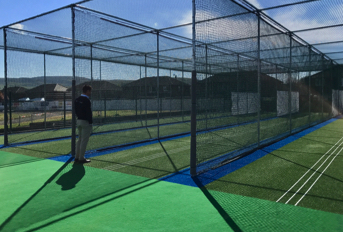 An introduction from Heras Sports Fencing led to ECB code of practice installer for non-turf pitches, total-play Ltd, being appointed to install the cricket practice nets facility in late Autumn 2013. Following in-depth discussion total-play then put forward a proposal to undertake the rest of the project in the New Year; effectively offering the client a ‘turnkey’ solution and single point of contact throughout. In terms of the tennis court refurbishment the Tennis Club saved some money by dismantling the existing fencing and selling the ‘scrap’ to a sponser of the Cricket Club. total-play then helped specify and install new powder-coated green uprights and robust green PVC covered chain link fencing alongside new kerbs to allow for future resurfacing , a 300mm wide mowing strip around the perimeter of the fence and stabilizing banking next to the play ground. 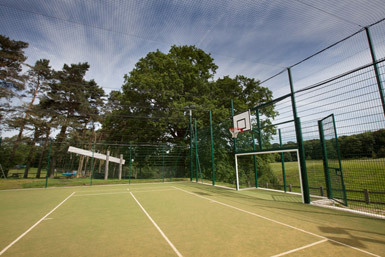 total-play also excavated and laid suitable trunking for the electric cabling and managed the installation of floodlights to the courts by a specialist supplier. 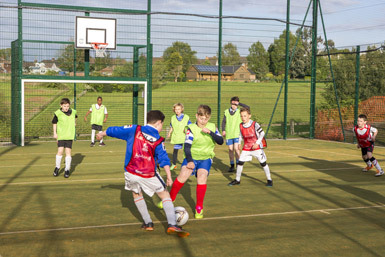 The MUGA element of the project saw total-play construct a fibre bonded, sand-filled synthetic sports surface suitable for 5-a-side football, basketball, mini tennis, and netball on the site of a junior tennis court demolished by the client. 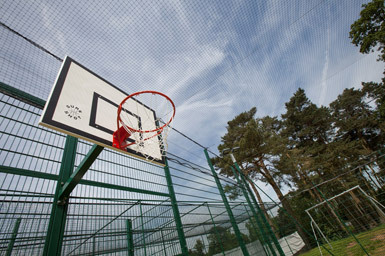 total-play specified and oversaw the installation of new green Heras Sports Fencing complete with recess goals and basketball hoops before undertaking the construction of the facility’s sub-base, tarmacadam surface and laying the new carpet. 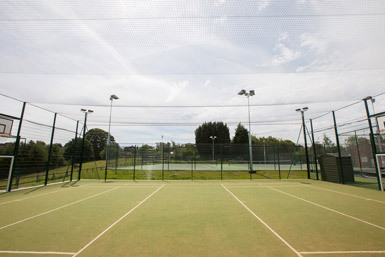 The system was completed with the cutting in of two mini tennis courts. total-play then moved and re-installed existing play equipment to a new site before undertaking landscaping to complete works on site. 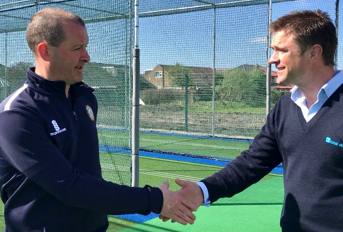 The new facilities were officially launched on 2nd May 2014 with celebrity guests in attendance including Alastair Cook MBE, England Cricket Captain, the Rt Hon John Bercow MP, Speaker of the House of Commons and former Olympic and World medallist Kriss Akabusi MBE.